Venerable Benedict was from the city of Nursia, which is in Italy, and was the son of pious and wealthy parents. Leaving his homeland and his parents when he was very young in age, he went to a deserted place with the one who raised him. There he befriended himself with God by means of virtue and asceticism, and was enriched by Him with the power to work miracles and healings. The wonders which he performed are at length narrated in his Life and history. * He raised the dead, foretold the future, and conversed regarding things that are far off as if they were present. We will only say here as is necessary, that when the Saint was about to depart to the Lord, he was able to disclose to his disciples that were near to him, as well as to those who were far off, that he was to die, and only one sign was to take place, by which all would know that he was separating from his body. Therefore, six days before his venerable repose, he ordered his tomb to be opened and made ready, and immediately he was overcome by a burning fever, by which his body dried up over six days. On the sixth day, he ordered his disciples to take him up, and bring him into the small church they had. Arriving there, he communed of the immaculate Mysteries, standing amidst his disciples. Being held up and made sturdy by them, he lifted up his hands to heaven, and in this way he looked up and prayed, delivering his holy soul into the hands of God. At that moment a vision appeared to two brothers, one of whom was living in silence in his cell, while the other dwelt far away. Truly both beheld this, for behold they saw all the way from the holy man's cell, towards the east even up to heaven, hung and adorned with tapestry, and shining with an infinite number of lamps, at the top whereof a man, reverently attired, stood and demanded if they knew who passed that way, to whom they answered saying, that they knew not. 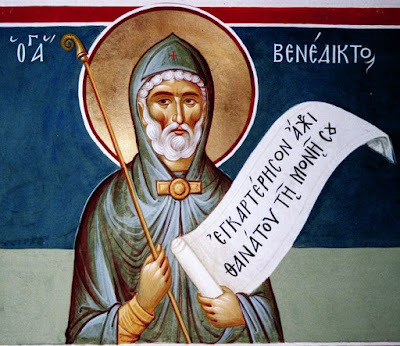 Then he spake thus unto them: "This is the way," he said, "by which the beloved of God, Benedict, is ascended up to heaven." And by this means, as his monks that were present knew of the death of the holy man, so likewise they which were absent, by the token which he foretold them, had knowledge of the same thing. * His Life can be read in the second book of the Dialogues of Saint Gregory the Great. ** Benedict built a monastery on Monte Cassino in the mountains of southern Italy in the year 530. His disciples and successors were later known as Benedictines. He was the first to establish monasticism in the West. Among his accomplishments was compiling a Rule by which his disciples were to conduct themselves. Seventy-three short chapters comprise the Rule. Its wisdom is of two kinds: spiritual (how to live a Christocentric life on earth) and administrative (how to run a monastery efficiently). Following the golden rule of Ora et Labora - pray and work, the monks each day devoted eight hours to prayer, eight hours to sleep, and eight hours to manual work, sacred reading, or works of charity. Saint Benedict contributed more than anyone else to the rise of monasticism in the West. His Rule was the foundational document for thousands of monastic communities in the Middle Ages. 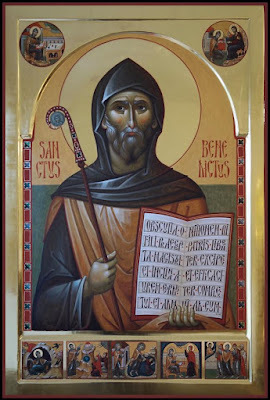 To this day, the Rule of Saint Benedict is the most common and influential Rule used by monasteries and monks, more than 1,400 years after its writing. He died of a fever at Monte Cassino not long after his sister, Saint Scholastica, and was buried in the same place as his sister. According to tradition, this occurred on 21 March 543 or 547. By thine ascetical struggles, O God-bearing Benedict, thou didst prove true to thy name. For thou wast the son of benediction, and didst become a model and rule, to all who emulate thy life and cry: Glory to Him Who has strengthened thee; glory to Him Who has crowned thee; glory to Him Who through thee works healings for all. Like a sun of the fourteenth dayspring from on high, thou didst enlighten the monks of the West and instruct them by word and deed. By the sweat of thine ascetical achievements, purge from the filth of passions us who honour thee and cry: Rejoice, O Father Benedict.